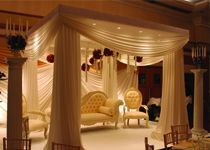 A wedding mandap is a covered structure with pillars, usually temporarily erected for the purpose of both Hindu and Jain weddings. 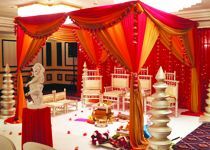 The main Indian wedding ceremonies take place under the mandap itself. 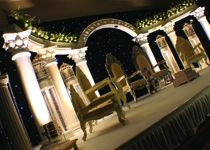 With a variety of Wedding and mandap services all less than one roof we are able to assist you with unique designs combined with the latest designers and technology to make your setting look a million dollars. 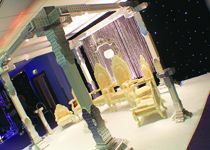 Our personalised service and high standards help turn your dreams into reality. 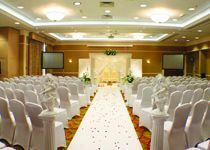 You will always be dealing with the experts directly with no third parties in between to ensure you receive the best possible customer service experience. 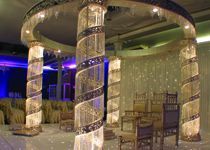 We offer you an extensive range of Mandaps for hire, ranging from crystal mandap, to wooden carved mandaps to elegant drape mandaps.